Most songwriters would agree that keeping your songwriter’s antenna switched on to the world around you at all times is the best way to come up with great song ideas. Being observant and keeping your mind constantly open for new ideas through your experiences, thoughts, feelings and observations can lead to some interesting songs. But flicking through stacks of old thrift shop photographs does it for New York singer-songwriter Elisa Flynn (pictured above; photo by Elizabeth Graham). She finds that random second-hand photos of strangers can inspire lots of innovative ideas. Try looking at old photos of people you don’t know, and ask yourself Who? What? Where? When? How? and Why?-type questions about each photo. The answers to these questions may generate words, phrases and lyrical themes that could stimulate some interesting song ideas! Of course, a good title or a lyric line can also come from overhearing a conversation on a train or in a café … or an event that you witness … or while you’re waiting at a traffic light. Similarly, a headline in a newspaper, on a website, or a billboard might spark a great idea for a song. What is the strangest source of inspiration you’ve ever found for one of your songs? ‘How (Not) To Write A Hit Song! 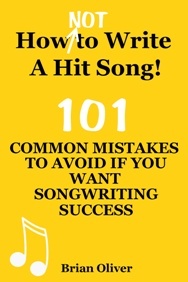 – 101 Common Mistakes To Avoid If You Want Songwriting Success’ is now available from Amazon’s Kindle Store for only US$7.22 or GB£4.78. Read a sample of the book HERE (USA) and HERE (UK and Europe). Taylor Swift advises new songwriters to use their past relationships to inspire great song ideas. The six times Grammy award winner always tries to draw on emotions she has actually experienced, she says, because she believes people can relate to songs more if they are based on real personal experiences. But it seems 23-year-old Taylor’s ‘true life’ approach to songwriting is making life hell for One Direction’s Harry Styles, her former boyfriend. Harry is said to be worried about what her next songwriting move is going to be. She has already written the hit song ‘I Knew You Were Trouble’ about the break-up of their relationship, and she has reportedly aimed another jab at Harry in the promotional video for her new song ‘22’. The poor guy apparently doesn’t know what to expect next! The 19-year-old One Direction star is reported to have told friends that he now regrets dating her because she keeps mocking him in her music. For Taylor, though, it’s all good material for her songs. Taylor explains that real feelings can result in several types of songs – from ‘missing-him’ songs and ‘frustrated-and-confused, don’t-know-why-it-ended’ songs … to ‘I know we can’t be together but I miss you right now’ songs. She says personal experiences can also inspire sad songs ‘tinged with anger’, guilt-laded songs, and sad songs that contain ‘a little bit of hope that he’ll come back’.